My SSS salary loan check was delivered to my address a week ago. How long did it take? Four days short of a month. Fast, right? I thought so, too. The most surprising thing about the application was that it was a breeze. Yes, it takes patience when using the SSS online portal but once you obtain access – applying for a salary loan is so easy. You have already signed up for my.sss, you know your user ID and password by heart, and your internet connection is reliable. Those are three assumptions I’m making. Now, once you’ve logged on successfully to your my.sss page, your first assignment is to find the ELIGIBILITY tab, and select “loan” from the drop-down options (as illustrated below). As a self-employed or voluntary member, you have no employer. Simply click the box as indicated on this image. Your Employer ID Number will be then automatically generated. Click “Submit”. Since I have 40 posted contributions, I’m eligible! I hope you are, too. If you click the Loan Disclosure Statement, you will get a copy of the full details of your SSS salary loan. 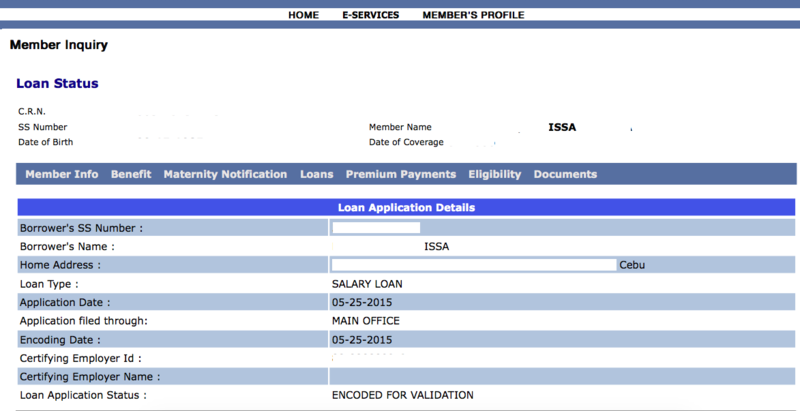 The day after I filed this loan online, I checked the Loan Status and it was approved! Then, I obsessively monitored its status the following days. To my frustration, the same message appeared: CHECK GENERATED. I wonder why no one ever talks about how unhelpful SSS text service is. Neil already warned me that tracking my salary loan through SSS SMS was, at best, useless. Curious me, I still tried. I thought if a service exists, then it must be helpful. Only to prove how Neil was right. 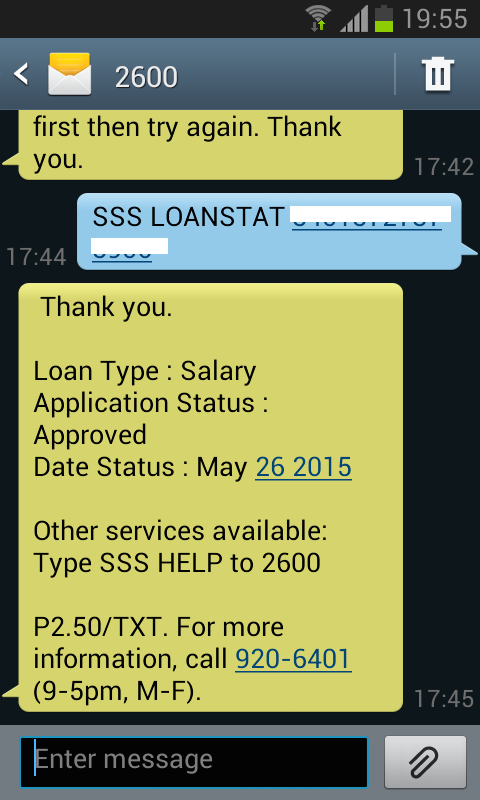 The SSS SMS service can’t tell you any significant info about your SSS loan status. You’d have a better chance of knowing by visiting the POST OFFICE and asking their staff for your SSS check. I did. And after a weekend, I got my check. In hindsight, I thought I would still get my SSS salary loan within a month. After all, it’s a loan with interest and SSS benefits from members who borrow from their own savings. *Please note that I’m located in Cebu so my circumstances might be different. I’m also not an employee of SSS, I just made a promise to share my experience with their service once I receive my loan. Nice Izzza, sama sa ka nice sa imong shades na akong gi comment na asa ka ni buy and if naa bay pares ato hehe. If previously employed sila, they need to change their status from employed to self-employed by paying as voluntary member. A check will be sent to the address you put on the loan application. 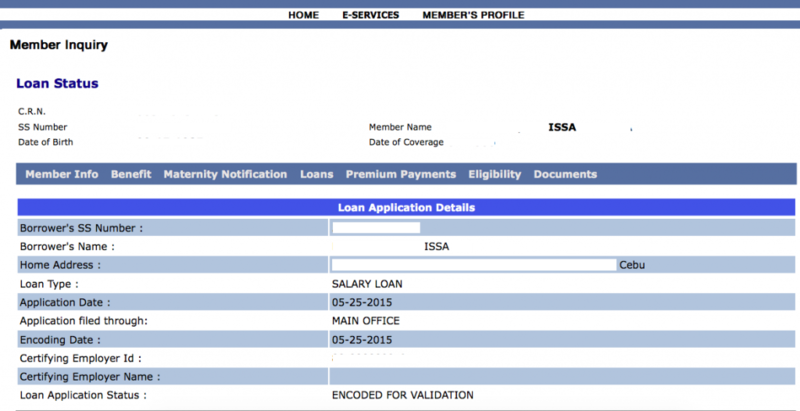 Did you apply for this loan online? If you log in, you’ll see the status of your loan. Hello would like to ask, once you click to the loan disclosure statement, does that mean that you already filed for the salary loan already? 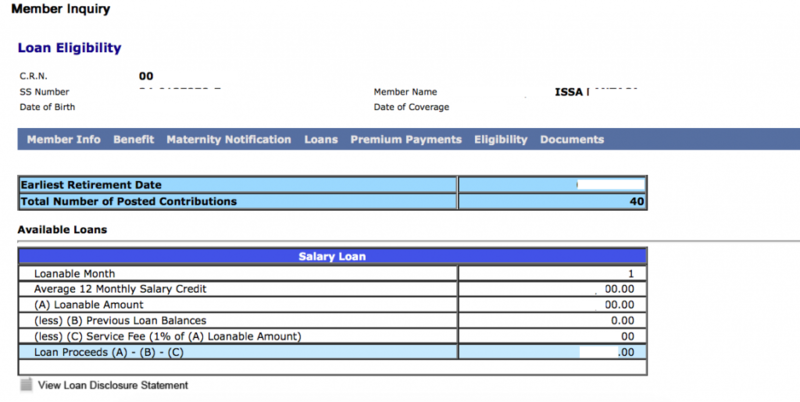 If you click the Loan Disclosure Statement, it will show a copy of the complete details of your SSS salary loan. After that, you can log on to check the status of your loan. It’s usually fast, in my experience, my SSS check was generated within a month. Approved na ba ang loan mo? If yes, you just have to wait for the check. It’s sent via post office. May online SSS account ka? You can check the status of your loan through your online account. hi i am currently employed and i am planning to resign but i wanna know kung pwede ba magloan kahit not connected kana sa company. i currently have 39 contributions posted as of now and i am still employed.i am planning to resign once i have verified n pwede magloan kahit wala ka na sa company..
p.s sa PAG-IBIG kasi dapat employed ka para makaloan ka or may source of income ka. ehh paano. gusto ko rin sana malaman kung same rule applies sa sss. I suggest you contact desuyomz@sss.gov.ph and member_relations@sss.gov.ph. Expect a reply within a day or two. At least you can get an official answer. Ang nasubukan ko lang kasi mag-apply while I was a “Voluntary Contributor”.. Wala na akong work nung nag-apply ako ng salary loan so walang middle person (HR or office manager) na kailangan kong sabihan na i-approve ang loan.. I applied it online and I got my loan within a month. I see. I just wanna know kung ilang months ka na naghuhulog as a voluntary member bago ka nagloan? Or would you happen to know if may mobile toll free number sila kasi na pwede icontact kasi ang hirap maghanap ng landline nowadays.Thank you for the quick response..
Ang kinababahala ko lang kasi is that qualify nga ako pero may required months na kylangan mong hulugan as a voluntary member bago ka mag apply ng salary loan. Example, magreresign na ako by the end of May tapos pag nag apply ako ng salary loan baka magrequire muna sila maghulog ako ng 6 months as a voluntary member so thatś around Nov. or December pa ako pwede magloan bago sila magpa allow ng salary loan. Hmm. Sa case ko, I had 40 posted contributions before na-approve ang salary loan ko as a voluntary member. When I checked online, ang nakalagay na hulog ko sa SSS hanggang December 2014 lang, kahit na ang last working day ko sa company, March 15, 2015. Can you check if your company remits the SSS contributions on time? So, nung nag-apply ako for loan by April, I had to pay as a Voluntary member first para ma-convert ang account ko from Employed to “Voluntary”. I paid 1,650 to cover April, May and June contributions (so three-month worth of voluntary contributions, 550 each month). I applied for a salary loan online at sss.gov.ph, then I got the money within a month. I just want to clarify things I’m employed po tapos nag apply po ako ng salary loan verify ko lang po sana kung employed ka po, sa employer ko po ba na address e sesend yung salary loan check ko? O do I need to update the mailing address for my salary loan check? @Ben, Question, magkaiba ba kayo ng work location ng employer mo? It will be easier to use your office address. The check will be addressed to you.. it has your name on it so you don’t have to worry. @Jerry Mae, it’s best to register for an online SSS account so you can check the exact loanable amount. In my case, I worked for a few years before paying my SSS voluntarily. For first-time loaners, P15K is usually the highest amount you can get. Hi Ms. ISSA, how much kaya pwede I-loan? over 10K kaya depende sa contributions? Hi, may I know how to contact SSS Post Office? Mine was “CHECK GENERATED” since April 25 but no check was delivered to my address until now. Thanks ahead. @Grace, If you’re currently employed, ask for your Employer’s ID. You need to enter that number (example: 88-8888800-6) to find out the amount you’re allowed to loan. So, log in lang sa SSS account mo, look for “ELIGIBILITY” tab. Hover your mouse on this tab, then you’ll see “Loan” under the drop-down buttons. Click that and you’ll find out the loan amount you’re allowed to take. If Voluntary member ka, just click the check box. You’ll see “Please Check this if Member is Self-Employed or Voluntary Member” next to it. Then you’ll know how much you can loan. Hi Haena! Voluntary/Self-employed member ka ba? If so, yes, you can go the nearest post office sa address na nakalagay sa SSS profile mo. For example, yung sa akin, in-address ko sa Mandaue City, sa Mandaue post office ko rin na-claim. For your specific concern, it’s best to message SSS directly at Facebook.com/SSSPh. Pwede rin tumawag sa 917-7777 o Telephone Brigade at 920-6446 to 55. Pwede rin sa 1-800-10-2255777 toll free mula Lunes hanggang Biyernes. You can also send an email to member_relations@sss.gov.ph. Voluntary/self-employed imo status or naa kay employer? Sa ako 1 day after I filed online, approved na dayon. Have you tried contacting desuyomz@sss.gov.ph and member_relations@sss.gov.ph to follow up? Any Idea how long marereceive ang check for voluntary loan? Ang pagkakaalam ko, sa pinakamalapit na Post Office sa address na nilagay mo sa SSS loan request. Pwede mo rin tawagan ang post office bago mo puntahan para di masayang ang time. Medjo complicated but I hope you can enlighten me. Akong status ron sa akong profile is still employed, but im already SE and pregnant, so meaning dugay pako mka work blik. Nag submit nako og Mat Notif under SE status. What I would like to know is, pde ba na akong ichange akong status from employed to voluntary then pay half of my existing loan(w/c is delinquent) then apply for a new loan immediately after paying half of my outstanding balance? And would it affect the amount of the mat benefit that i will claim in the future? Hi ma’am ask ko lng po if how many months ung maximum na Pde mu bayaran loan Pde ba 1 year ganun or Is it just for 1 month loan e sapatos bayad ka Na po? woulds just like to ask if may idea ka kung saan binebase ng SSS yung delivery ng check for Voluntary member? Nagkamali kc aku ng lagay ng address sa Loan applicaton page. Hindi ko po kasi nailagay yung name ng subdivision namin. Pero yung address naman sa Member’s details page is correct. Worried lang aku kc baka yun ang maging reason baka hindi ko agad makuha yung cheque ko. And tama ba, sa post office near your address mo pipick-up-in yng cheque? Hi! Can I get the post office tel. no in cebu pls? Tanong ko lang ano kailangan na ID para makuha mo ang cheque sa post office? Pwede rin tumawag sa 917-7777 o Telephone Brigade at 920-6446 to 55. Pwede rin sa 1-800-10-2255777 toll free mula Lunes hanggang Biyernes. You can also send an email to member_relations@sss.gov.ph. @Em, I had a workmate who was able to apply for maternity benefit while naa pa syay loan. @Dara, yes, an ID is a must. Hi. I submitted my salary loan application online last nov. 22. And now i checked the status online it shows as check generated but what bothers me is that the address on the loan status page shows incomplete. It only shows the house number and street name not including my city state and postal code. Ive made sure i put all the info before submitting the application. And isnt it that you wont be able to submit the application without filling those required info. But Why is that? SSS Call Center telephone numbers: (632) 920-6446 to 55 (open from 7:00 am of Mondays to 7:00 am of Saturdays). hi po miss isssa. Nagloan salary loan ako sa sss website as voluntary nung dec 21, 2017. oag ka check ko po now check generated na sya.. question.. kelan po ako pwede punta post office para icheck kung andun na yung cheke? kasi may flight po ako ng december 28 papunta okinawa. january 10 pa po balik ko.. pwede po ba mag iwan ng authorization letter sa bahay para makuha kung sino madatnan sa bahay? Mag-iwan ka na lang ng ID and authorization letter para sigurado. Sa akin umabot kasi ng halos isang buwan, eh. Since holiday ngayon, baka ma-delay ng konti yung sayo. Ngloan apply po ako ng loan sa sss branch dito sa bulacna jan 4. Tumawag ako kagabi sa sss narelease na daw sa kanila yung cheke nung jan 9 pwede ko na kaya puntahan yun sa post office? Sorry for the late reply. Dapat i-deliver nila or i-notify ka through a valid phone number na for delivery na ang check. May number ka ba sa post office? According to SSS website, pwede raw. 1. She has paid at least three monthly contributions within the 12-month period immediately preceding the semester of her childbirth or miscarriage. 2. She has given the required notification of her pregnancy to SSS through her employer if employed; or submitted the maternity notification directly to the SSS if separated from employment, a voluntary or self-employed member. Bisita ka na directly sa nearest SSS branch sa inyo.. para maclarify mo agad. Baka na-delay lang dahil sa Holy Week break. Try mo rin i-check ang status online. Baka na-approve na. Meron po ba makakasagot kung ipapadala ng SSS ung cheke sa mismong address na nilagay mo sa loan application? Nag-apply po ako ng loan online sa SSS website, then ang status is CHECK GENERATED pero wala pa po ako nareceive na check. Last March 19 pa ako nag-apply. March 14 pa ako nagsend ng online application for SSS Loan. I’m a voluntary member po pero hanggng ngaun wla pa ding status. Pending pa din siya. nag send n po ako email sa member relations nila pero wala pa din po. paano kaya yun? maraming salamat! You can post questions directly on their page: https://www.facebook.com/SSSPh. April 14, 2018 I received an email from SSS na na-approved na yung Loan ko (Voluntary Member). San ko po kaya pwedeng mai-follow up kung nairelease na nila yung cheque at san ako pwedeng tumawag? Thanks and more power. God bless. Sa pinakamalapit na post office sa inyo. San mo in-address ang cheque? Ang schedule kasi ng delivery nakadepende na sia PhilPOST.Try mo tawagan ang number or i-email sila dito: https://tracking.phlpost.gov.ph. ask ko lang kung yung sa system nila authomatic bang magchange from employed to voluntary yun status ko kasi nakalagay pa din yung previous employer ko pero nagloan ako thru online pero kasi ng voluntary payment na ko since wala na kong work…as i checked their system check generated na, do you have any idea san kaya mapapadala yung cheque sa previous employer ko pa din ba or sa mismong address na ng bahay namin.??? thanks for your reply. Ang alam ko pag nagbayad ka na as voluntary member, ia-update na nila sa system. Ang check, ipapadala nila kung anong address ang in-indicate mo sa SSS online account mo..
Hi po..ask lang po aku may loan balance po aku nong employed pa po..aku mga atleast 1 year napo..gusto ko sanang mag halfway may lo loan…po sana aku pwede pobang magloan…magbabyad lang aku ng 2months sa sss..balepo APRIL po kasi yung last contribution ko at babayaran ko po ngayun ang MAY ,JUNE. as aself employed? ?po makakaloan po ba aku? Ng halfway? @Noemi Pasensya sa delayed response. Pag nagbabayad ka sa SSS ngayon, makakatanggap ka ng text confirmation kung posted na ang payments. Para makasiguro, pwede mo rin i-check kung nag-reflect na ba online ang payment. You can text SSSCONTRIB(SSS Number, no dash or space)PIN # to 2600 (P2.50/text ang charge) para makita mo yung last date of posted contribution ng asawa mo. If di ka pa naka-register sa SSS TEXT service, you just have to send these codes first: SSSREG(your SSS number without space or dash)(Your Birthday in month, day, year format, ex. 11231989), then send it to 2600. Pag na-receive mo na ang PIN, you can start using SSS HELP. Or, you can call their hotline number at 920-6401 from Monday to Friday (9AM – 5PM). Hope that helps. Renewal shall be allowed after payment of at least 50% of the original principal amount and at least 50% of the term has lapsed. Pero I suggest, you email or call them to inquire. hello po, ask ko lang po, kc po employed ako before, then kc im no longer working na, nag bayad ako this month sa sss, but it was still showing na employed padin ako hindi nag shoshow na voluntary member ako paano ba dapat kong gawin don? automatic bang mapapalitan un pag nagbayad ako sa sss or kailangan kopa ipa change ? Ilang buwan po ba dapt bago mag loan kapag bago kapalang resign.so ano po ba ang dapat kong gawin. @Al, automatic ang update sa status change from employed to voluntary. Try paying more contributions as voluntary. I usually pay quarterly and nag-reflect agad sa online SSS records. @April, Sorry late reply, I hope di ka pa nag-resign. When you apply for a loan via your HR, it usually takes a month (depende rin sa HR nyo if in-apply nya agad nung nagrequest ka). Pero kung hindi, made-delay din. If close ka sa HR, ipa-prioritize mo. If hindi, pwede ka naman magresign, pero dapat sure ka na up-to-date ang contributions ng company mo. hi maam, ask ko lang, kasi nag salary loan ako through online services, nag email na sa akin na approved na ako, pero pano ko makeclaim yung loan ko, wala naman sila sinabi kung panu ko kukunin ung loan ko sa kanila?